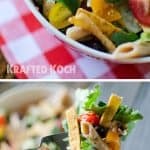 This salad is part pasta salad/part lettuce salad, and the combination is great! I love adding some al dente pasta to a lettuce salad to add a nice bite. 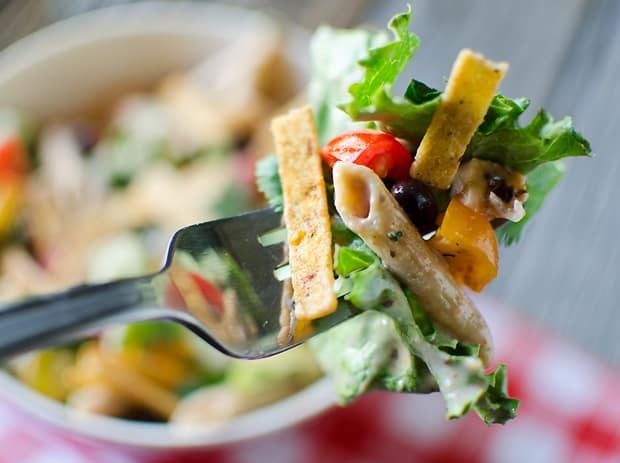 In combination with the crispy romain, spicy salsa ranch dressing, healthy vegetables and crunchy tortilla strips, this salad is is loaded with flavor and texture. By making the dressing with non-fat Greek yogurt and salsa, we cut way back on the calories and fat too! I am starting to plan ahead for my sister’s upcoming bachelorette party that I will be hosting later this month. We decided to camp out at a cabin for a weekend with all the girls and have lots of food, drink and fun. 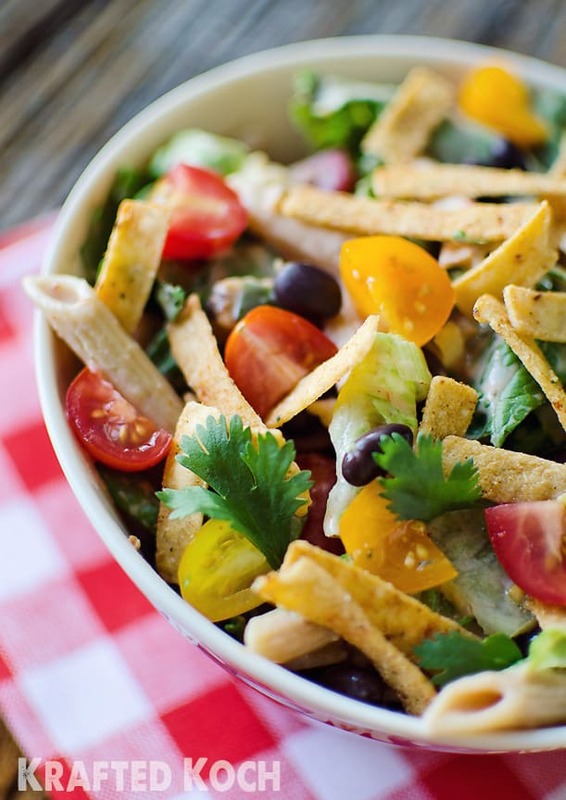 I thought this salad would work great for one of the lunches, seeing it is hearty with plenty of protein from the chicken and black beans, but will still appeal to those wanting to eat a bit healthier. 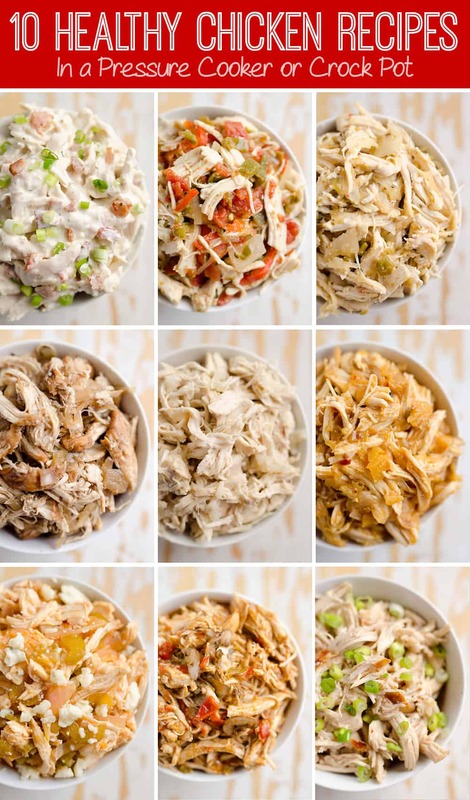 What are some of your favorite dishes to prepare for large groups? Cook pasta in salted water according to directions until al dente. Rinse under cold water to stop cooking process and toss with 1 Tbsp. olive oil. To the penne, add cilantro, black beans, tomatoes, chicken and green onions. In a separate bowl combine the yogurt, salsa and ranch. Pour the salsa ranch over the penne mixture and mix everything together. Add the romaine to the mix and fold gently so everything is coated evenly. 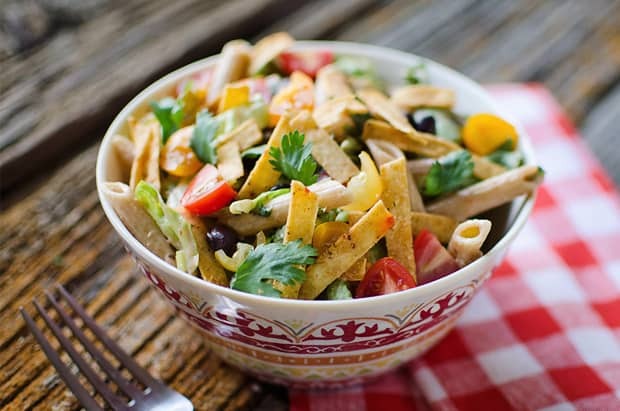 Top with tortilla strips and serve immediately. This = best lunch ever. It looks amazing. I’m a sucker for southwest anything and everything! 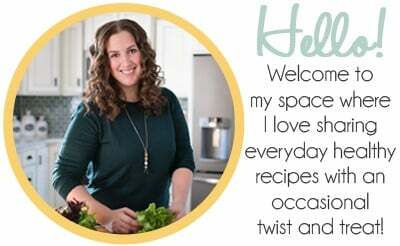 Love the mix of pasta in here too.